I don’t know what I was thinking. I hadn’t done a half marathon in umpteen years. “Oops!” as the saying now goes. But thanks to my cooler than cool friend, Lorena Lama, I somehow finished the 13.1 half marathon in Fort Lauderdale Sunday. Also the support from friends on Facebook and Twitter was great! It’s like we had a virtual cheering section. Our phones were bonking and beeping the whole way so thanks to everyone. 1) Have good equipment. 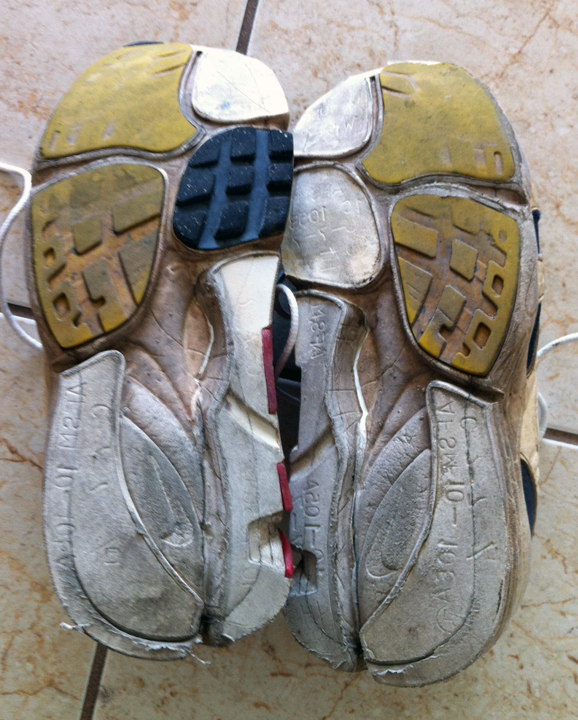 My sneakers somehow peeled apart piece by piece which didn’t help my mind or my tootsies. Yes, the places in this picture that once had color all peeled off or I ripped them off because they were dangling. I almost deep sixed them and tried to take it home in my socks. 2) Don’t bring cash with you. When the blistering began at mile four, it was almost too easy to hail a cab. Lorena didn’t know I almost did on four occasions. 3) Do train specifically for the race. All the spin classes and stairmaster work in the world doesn’t prepare you for the repetitive movements that cause half dollar-sized blisters. 4) Stay away from the sand! Somehow sand got in my running sneakers and that’s what caused the blisters. Think about sand grinding around in your shoes for 3 hours. It felt as badly as it sounds. Just like everything I’ve ever started in life, I’m a finisher. I made it with a little help from my friends. So let’s have a little fun and go to the videotape on this. If you have any questions, fire away and thanks again for your support. I loved this analysis from New York Times Columnist Charles M. Blow on the November 9th Republican debate in Michigan. Sweet and in one tweet. I believe in second chances, do you?